Jon Ossoff, Karen Handel face off in Georgia special election | Circa News - Learn. Think. Do. Republican Karen Handel has a slight edge over Democrat Jon Ossoff in Georgia's House special election, according to The Hill. Handel boasts approximately 51.6 percent of the vote to Ossoff's 48.4 percent with about 39 percent of the precincts in. With roughly four percent of precincts reporting, Ossoff slightly edges Handel, according to Politico. Ossoff came in around 50.4 percent compared to Handel's 49.6 percent. Democrats are gunning for a win not only because it would be the first House seat held by one of their own since 1979, but it would also reflect how Americans are reacting to a Trump presidency. ORIGINAL STORY: More than $50 million has been spent on the special election in Georgia's 6th congressional district, making it the most expensive House race in history. On Tuesday, voters will head to the polls to choose between Democrat Jon Ossoff and Republican Karen Handel. The winner will fill the seat vacated by Tom Price when he became President Trump's health and human services secretary, but the race has become much more than that. Here are five things to know ahead of the vote. Many are viewing this election as a referendum on the popularity of President Trump. Trump's approval rating has been dragged down by questions about his campaign's alleged ties to Russia and his firing of former FBI Director James Comey and currently stands at just 36 percent, according to CBS News. "This race is a referendum on Republicans and the Trump administration nationally, no question," Phil Kent, a Republican political commentator based in Georgia, told Politico. Trump weighed in on the race early Monday. An Ossoff win would energize Democrats -- and their donors. It would provide hope that the party could expand its map and challenge Republicans for control of the House in next year's midterms. But a loss, even in a district that has historically leaned Republican, would be viewed as a setback given all the buzz surrounding the race. 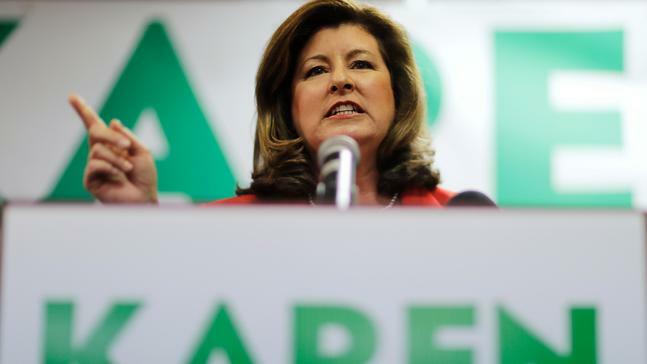 A win by Handel would give Republicans an endorsement of their agenda and the sense that they're on the right track -- or, at least, that they can avoid being dragged down by Trump in the 2018 midterms. And of course, it would demoralize Democrats, who have already lost four special elections to Republicans this year. All the attention focused on the race has led to remarkable voter turnout. 194,000 voters cast ballots in April's primary, with 57,000 of them coming early, according to The Hill. More than 143,000 have voted early for the special election, and some expect more ballots to be cast than in the 2014 midterm election. Ossoff holds a slight lead over Handel in the latest poll from Atlanta TV station WSB. Very slight. Given the margin of error -- 3.5 percent -- it's still anyone's race.